Progression 1: use basket of items the child is familiar with. Progression 2: use parts of the body including clothing. 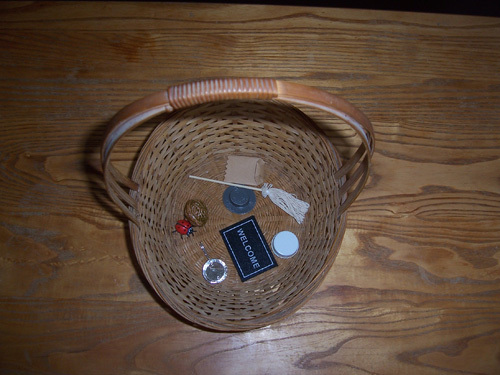 First Presentation: Make sure the child knows the names of the all objects in the basket: take one object out of the basket and ask the child "What is this?" If the child does not know, say the name, ask the child to repeat the name, and place it back in the basket, and take another object, etc. (Sometimes this is the only thing you do, give the name of the objects, for very young children.) Buy a set here for $60, or go to a craft store and look for items. Items from around the house: a lid, a plastic animal like a cow, cat, dog, pig; items from a doll house like a bed; and a rock. If the child knows the names of the objects, begin your I Spy lesson. 1. "Today we are going to do the I SPY GAME. Please listen . . . I spy with my little eye something in this basket [you can take them all out for the children to see and they can name them] something that starts with "b" [buh]." Child raises hands or says "ball." 2. Go through all the objects, seven to ten is enough. Keep the basket on the language shelf for children to play the game. It’s a language work, not for toy playing, but if you allow them to play with the objects, they should play the game of I Spy first and or say the beginning sound of the objects as they take them out of the basket. 1. After a few weeks or months, when children are ready, progress to the last sound. 2. "I spy with my little eye something in this basket [you can take them all out for the children to see and they can name them] that has the last sound of "l." Child raises hands or says "ball." You can use the same objects, maybe adding a few new ones now and again to regain interest. 3. Progress to things you or another child is wearing, or body part, like shoe, hair, etc., only you are using the last sounds. 1. "I spy with my little eye something in this basket [you can take them all out for the children to see and they can name them] that has the middle sound of "a." Child raises hands or says "ball." You can use the same objects, maybe adding a few new ones now and again to regain interest. 1. "I spy with my little eye something in this basket [you can take them all out for the children to see and they can name them] a b-a-ll." Child raises hands or says "ball." Remember to say the sounds, not the names of the letters! 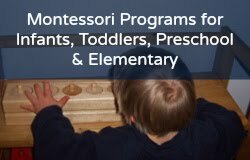 You may also be interested in more of my Montessori activities here!